I have noticed that a lot of members here have violas. Where did you guys get them? 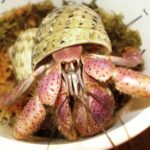 The only source I could find was livehermitcrabs.com and after two seconds of searching on here, it became pretty obvious that they are on the up and up. So am I missing something? I do not know of any sources in the U.S. for violas. The people that I know of who have them either got them from petshop flukes, or ordered them from a highly disreputable vendor online who is banned from every respectable crab forum that I'm aware of. I lot of members have had their exotics for many years as well... and are not recent purchases. It's been several years since someone got one in an accidental shipment. soilentgringa wrote: I do not know of any sources in the U.S. for violas. I will mention that back in the day that store wasn't as bad as it is today, before they actually use to mail out the crabs... It changed roughly in the last couple of years - maybe late 2014? I'm talking about an overseas shipper, not LHC. Darn. Hopefully all those captive breeders really kick things up for the rest of us. One can dream I suppose. Really wish I could get my hands on some Brevimanus, or Violas. I live in Texas, ain’t no way I’ll ever see an exotic near me. hopefullcrabber wrote: Darn. Hopefully all those captive breeders really kick things up for the rest of us. One can dream I suppose. Well, considering that out of hundreds of eggs only a handful usually survive to micro crab stage, that won't be likely in our lifetimes unless some serious advancements have been made. stellaplusrocky wrote: Really wish I could get my hands on some Brevimanus, or Violas. It took me 3 years of rescuing in the metroplex to come across adobtable exotics. I had an opportunity to take a 125 gallon tank with straws, a rug, an indo and IIRC some E's and a viola but I couldn't do that at the time. Less than a year ago, I was able to take in 2 straws. It took me 7 years of on/off searching to find my Rug, and I missed out on the five others by a few days. They had been at the store for months and I never thought to check, my friend thought they were Es so never said anything!